Anyway, I ordered a new full suspension bike. It is scheduled to arrive in the middle of August, so I'll do a little look at my previous full suspension bikes in this post. 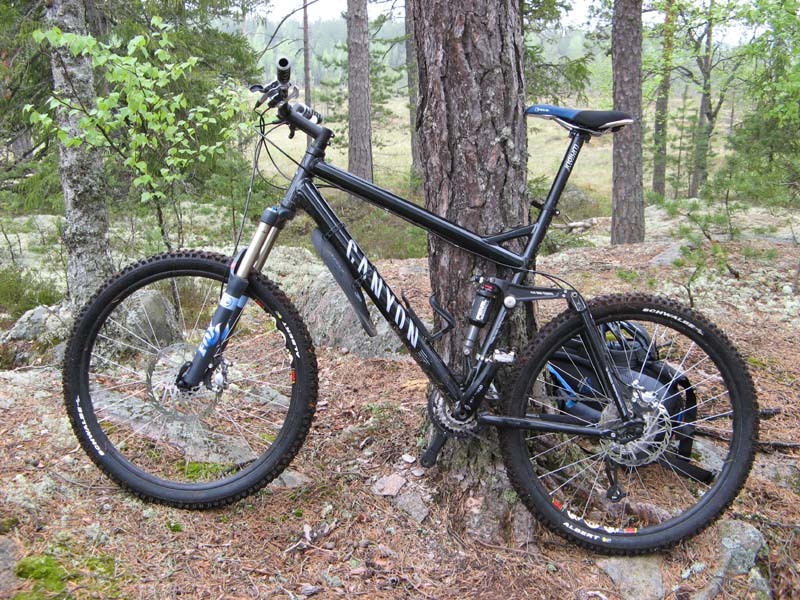 My first full suspension bike was a Canyon Nerve ES, bought in 2007, a bike with nice parts except for the Shimano hubs, which couldn't take the abuse. The front suspension with a Fox fork was the best I've ever had and the bike had 140 suspension front and rear. Looking at it now it looks quite strange. 26" wheels were always too small for me and the head angle, which not extremely steep, was still a long way from the slack geometries of today. It really was a recipe for endos, a small stone or anything you didn't see immediately had the potential of throwing you over the bar. In 2008 I sold the Canyon and got a Gary Fisher Hifi 29. It had 100 mm suspension rear and front and and XC geometry with an even steeper head angle, but the 29" wheels were still infinitely better. The first version was however a bit underengineered and after a 24 h race in Kangasala 2009 I noticed that not everything was as it should. I got a new frame on warranty, though it took quite some time. The new Hifi 29 was a lot burlier and clearly a better bike. At this point my interest for full suspension bikes had fade a bit, though. I got the Salsa Fargo in January 2010 and I rode mostly that one for the rest of the year, that is until I got my first fatbike, a Surly Pugsley, in October 2010. In 2012 I sold the Hifi 29. The following years went with the Salsa Fargo and a fatbike. 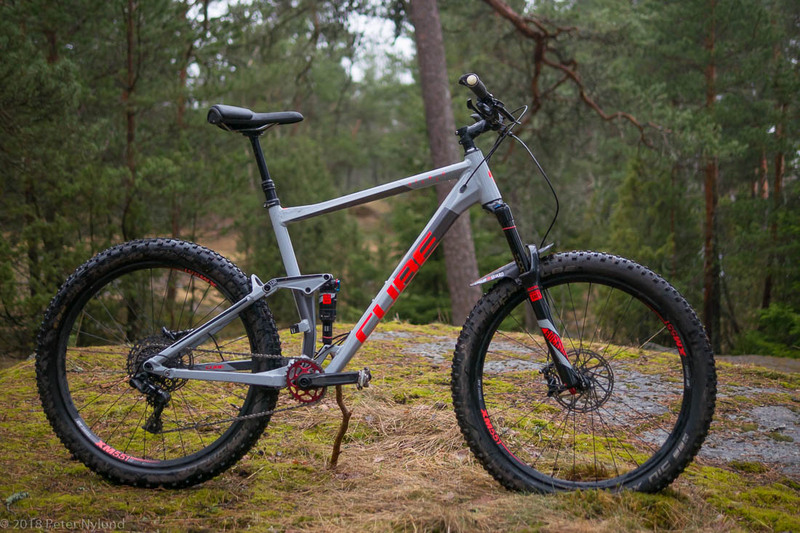 During the Vigu downhill cycling course in 2016 I again got interested in full suspension bikes and later that year got a Cube Stereo HPA 150 27.5+ bike, with 150 mm suspension front and rear. A quite nice bike, but at that point I was already quite solidly in the 29+ camp, after having ridden a lot with my 29+ converted Salsa Mukluk with front suspension. The Cube still served me well during 2017. The 27.5 Cube was a capable and fun bike, but I still found the wheel size a tad small. At my height, 192 cm, I think 29+ is the best choice. Well, 29" is also nice, but I've become addicted to slightly fatter tires, and the 3" tires really feel more like fatbike tires than skinny tires. Ever since building up the 29+ Salsa Mukluk in 2014, I've followed the bike world to see when someone would make a reasonable 29+ full suspension bike. An American manufacturer, Lenz, did have 29+ bikes since about 2014, but I always thought the bikes were a bit short and high. No really the geometry I wanted and I wouldn't have been able to afford them anyway. In 2017 Salsa came out with the Deadwood 29+ full suspension bike, but with only a 100/90 mm travel and very long chainstays it wasn't what I was looking for. Then it happened. In April 2018 Trek announced the Trek Full Stache 29+ full suspension bike, with a very nimble geometry and 130 mm travel front and rear. It ticked all the boxes for me and I went to a local Trek store, Nummen Pyörä, to take a look at it. Unfortunately they didn't have one in my size, but two of my friends bought the only bikes of the shop. They sold out in Finland very quickly. The Cube was sold and an order was made. It should arrive in the middle of August. From all accounts it seems like a perfect bike for me. Some small flaws, like a flexy rear and, but as a whole it is really interesting.